Not to be confused with street running used by railways. For the bird commonly referred to as roadrunner, see Geococcyx. These events are usually classified as long-distance according to athletics terminology, with races typically ranging from 5 kilometers to 42.2 kilometers in the marathon. They may involve large numbers of runners or wheelchair entrants. The three most common IAAF recognized distances for "road running" events are 10K runs, half marathons and marathons. Despite this, there are far more 5K road race events, due to their popularity for charity races and similar, less competitive reasons to hold an event. Road running may offer those involved a range of challenges and interests such as dealing with hills, sharp bends, varied surfaces, inclement weather, and involvement in a large group. Aerobic fitness, or the ability of the body to use oxygen, is the biggest factor contributing to success. The impact of running on roads puts more stress on the feet, knees and lower back than running on dirt or grass. It can compensate by providing a consistent, level surface. It may put less strain on the Achilles tendon. Before engaging in road running, one should choose a shoe that best suits one's foot type and running style. Road running is one of several forms of road racing, which also include road bicycle racing and motor vehicle road racing. Race courses are usually held on the streets of major cities and towns, but can be on any road. The IAAF recognizes nine common distances for road races: 10 kilometres (6.2 mi), 15 kilometres (9.3 mi), 20 kilometres (12 mi), half-marathon (21.097 km or 13.1 mi), 25 kilometres (16 mi), 30 kilometres (19 mi), marathon (42.195 km or 26.2 mi), 100 kilometres (62 mi), and Ekiden marathon relay. Other common distances include 5 kilometres (3.11 mi), 8 kilometres (4.97 mi), 12 kilometres (7.46 mi), and 10 miles (16.09 km). Some major events have unique distances. The "Round the Bays" run in Auckland, New Zealand is 8.4 kilometres (5.2 mi); the Falmouth Road Race in Falmouth, Cape Cod is 7.1 miles (11.4 km); the Manchester Road Race in Manchester, Connecticut is 4.75 miles (7.64 km); "City to Surf" in Sydney, Australia is 14 kilometres (8.7 mi); Honolulu's "Great Aloha Run" is 8.15 miles (13.12 km); the "King Island Imperial 20" is 32 kilometres (20 mi) long; and the "Charleston Distance Run" in Charleston, West Virginia is 15 miles (24 km). Most road race courses are certified to be accurate to within 0.1%, that is, to within 10 m for a 10 km race. Certified courses are often intentionally lengthened by one metre per km to ensure that they are not short of the stated distance. A Jones Counter attached to a bicycle is used to measure course length. Remeasurement to verify the length is undertaken when a world record is set on a course. Running that covers a distance farther than a marathon is called ultrarunning; the event is an ultramarathon. Such events can be measured in distance (for example, 100 kilometers) or by time (whoever has run the farthest after 24 hours). Examples include the London to Brighton run in England which is just over 54 miles (87 km), the Comrades Marathon run between Pietermaritzburg and Durban in South Africa which is about 89 kilometres (55 mi), and the Badwater Ultramarathon between Death Valley and Mount Whitney in the United States which is 135 miles (217 km) (with a net elevation gain of over 4,500 meters, almost 15,000 feet). Beyond the ultramarathon lie the multiday and stage races. These events include current events such as the Self-Transcendence 6- & 10-day Race and 3100 mile races in New York, Trans-America, Trans-Gaul, Trans-Korea, Trans-Europe race and the cross Germany race - the Deutschlandlauf. In these events runners have to complete as many miles as possible in the given time limit - the go-as-you-please style or have to complete a given distance in a set time such as the daily stages of the trans-country races where cut-offs are enforced. 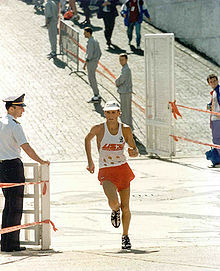 Road running is unique among athletic events because in many cases first time amateurs are welcome to participate in the same event as members of running clubs and even current world-class champions. Sometimes race times are recorded manually by race organizers, most road races feature electronic timing using transponders. 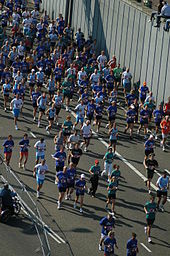 Road races are often community-wide events that highlight or raise money for an issue or project. In the US, Susan G. Komen's Race for the Cure is held nationwide to raise breast cancer awareness. This race is also run in Germany, Italy and Puerto Rico. Similarly, Race for Life holds races throughout the UK to raise money for Cancer Research UK. First person "race reports" frequently appear on the Dead Runners Society electronic mailing list. Dublin, Ireland's Women's Mini-Marathon is said to be the largest all-female event of its kind in the world. The international governing body for road racing is the IAAF. National governing bodies which are affiliated to the IAAF are responsible for road races held in their country. 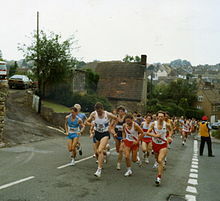 Of the thousands of road races held each year, 238 races, including some premier ones, are members of the Association of International Marathons and Distance Races (AIMS). Many race organizers (or the running clubs which conduct the races) are members of the Road Runners Club of America. In addition, the USA Track & Field plays a role in selecting representatives for certain international competitions under the Amateur Sports Act of 1978. Competitors from around the world participate in what are dubbed the "elite" races for cash prizes. Kenyans and Ethiopians are renowned for their skill and it is rare for a race's top finishers not to include competitors from these countries. Elite level road running series include the World Marathon Majors, the Great Run series, and IAAF Road Race Label Events. ^ "Top 10 running surfaces". runnersworld.co.uk. Retrieved 18 October 2018. 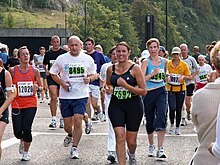 ^ "Running: Learn the Facts and Risks of Jogging as Exercise". medicinenet.com. Retrieved 18 October 2018. ^ "IAAF: 100 Metres - men - senior - outdoor - 2018 - iaaf.org". iaaf.org. Retrieved 18 October 2018. ^ "UK Road Running Race Course Measurement". www.coursemeasurement.org.uk. Retrieved 18 October 2018. This page was last edited on 2 April 2019, at 15:37 (UTC).